Contact me with any problems, and please setup your 2 matches early. Leaving it to the deadline invites disaster at the hands of the VASSAL server, and there will be no extensions! 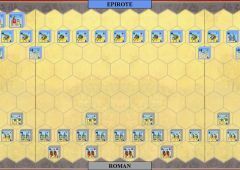 Tough game for Rome, the battle took place almost entirely on the right flank where the Epirotes got an early break and rolled forward. A closer fight, This one played out on both flanks, culminating in an clash on the left with the elephants. Rome managed to hold and push back for the win. Elephant was very strong and and difficalt to kill: Mounted Charge with Med Cav, 4 dice: SWX, SWX, LIT, HEV - no hits to him! I was very licky: 1st banner - killed leader, two helmets. 6th banner - killed leader, one helmet. This battle was decided in the last instant. The Epirotes managed to get to a 4 - 1 score after which the Roman heavies destroyed all Epirote heavies and killing a leader, bring the score to 5 -4 for the Romans. The Epirotes then attacked a weakend Roman heavy unit with elephants and destroyed it. The attached leader escaped. The Romans reacted with their lights to attack the elephant which was lucky to escape. With one block left. The epirotes attacked a light unit with a medium unit with leader attached. They rolled two flags and two direct hits. 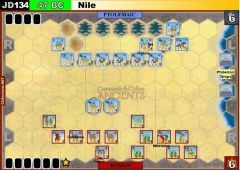 The roman lights could not evade which ended the game with 6 -5 for the epirotes. It was a close finish in which the Epirotes were lucky. 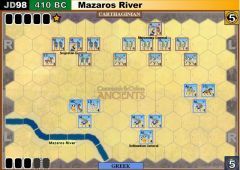 The pattern of the battle was not fundamentally different from our first game. 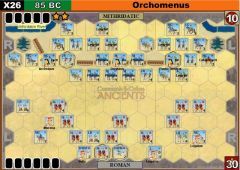 The Romans tried to play actively flank and light troops. But the phalanx of Pyrrhus managed to catch the cavalry of Rome (on Mounted Charge!) at the "First strike" and destroy it. 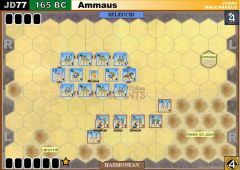 Further due to the best management cards of the feast of his heavy troops and elephants managed to get into shooting distance. 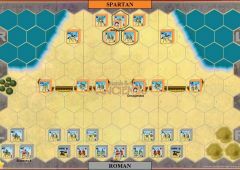 When "Spartacus" to break the Roman line formation, after which the elephant overturned two troops of the Romans and the cavalry of the Greeks was cut, pressed to the edge of the field unit of velits. We have mirrored the victory of 6:2 for Pyrrus both times. Romans Tomek’s was really difficult. Order heavy units and they just missed the move. The Rally, when only light troops can be recovered. Everything points to a crisis of command cards. Thank Tsvetomir Dark Bulgarian for the games. After tentative skirmishing on the flanks, the major blood-letting of this battle played out on the Roman right flank. 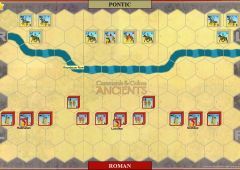 Aided by two counter-attack cards, Epirote forces went forward to meet and match the attacking Romans. Close combat continued back and forth, dragging fresh forces into the melee. At the crux of the battle, heroic Epirote warriors withstood an onslaught of Roman auxiliaries and heavy infantry unscathed, whilst the auxiliaries retreated much diminished and, worse, the heavies were wiped out. 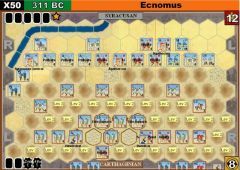 The dice gods had not been kind to the Romans, their flank was broken and the Epirote wing pursued the retreating auxiliaries to claim victory. Reviewing the log file shows that, as the Epirote player, I made a couple of errors with "Double Time" which went unnoticed at the time. Apologies to Mad Doc for these mistakes. Through clouds of skirmishing cavalry and light infantry, the Romans steadily advanced across the field. 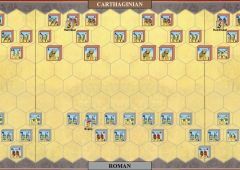 As the Roman left held off a series of Epirote attacks, the right pushed forward hard to win the victory. 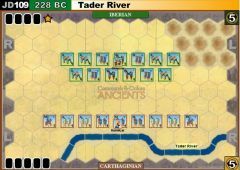 The battle began with the Romans moving forward and both sides trading range attacks. 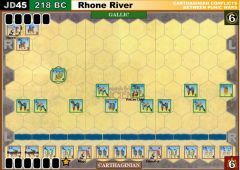 Romans took out L cav with 1 shot of 2 banners. Both sides moved up with Line Commands and Epirotes destroyed a Roman L Infantry. 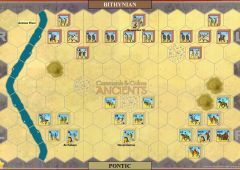 Battle lines then clashed and although both sides took losses, the Romans lost units while the Epirotes were able to hang on. A Cavalry Charge by the Epirotes eliminated 1 unit on each flank to end the battle. In a game which saw probably the most useless Light Bowmen that ever existed, I was able to make good progress on my left flank after culling my hand of suboptimal cards. That had me draw two line command cards which I was able to make great use of. A timely first strike card gave the Romans a second banner right before the end of the game. Same result but after a different battle. I tried to be proactive with the Romans and go for some early banners instead of giving Epirote the time properly organize his army. I put one leader on a MC so that he could act as a mobile command unit but that did not really work out. And of course I ran straight into a double time which MichalK used perfectly! Thanks to Michal for being a patient opponent and a really nice person in general. I am still not 100% used to VASSAL but I am already having a lot of fun!